Troy, you didn't give yourself enough credit. We all think that you did a superb job with Martha's blog...in letting us know what's happening, in posting neat pics, and letting us know how to pray! Thanks for the faithful updates! Glad that Silas is off of all of his tubes... YEA! And glad that he's liking his real food. Those are answers to prayer! Praying for that adorable baby and Mommy to be able to come home together, if that is what God wants. I cannot imagine leaving the hospital without my baby. Also praying for the WAY-TO-BUSY Daddy that didn't have time to take off for this special occasion, but was a GREAT father and was there for Martha, even though life and assignments kept going. Thank the Lord that you had a weekend in there, a few less assignments, hopefully. WE ARE PRAYING THAT GOD WILL HELP YOU GET EVERYTHING MADE UP, CAUGHT UP, PRACTICED UP, RECORDED, ETC. God cares and is able! Seems to me Martha's blog fell into capable "hands" during her time away. Appreciate the wonderful pictures and the detailed updates on both the Queen and the Little Prince. I'm sure everyone from the Castle is anxious to get back to the "routine" -- incredibly busy as it is! Oops! I forgot -- those new little ones have a way of disrupting the routine for awhile. Much love to all of you. PS -- I also enjoyed pictures of the King of the Castle (most assuredly), in case anyone was wondering. Troy & Martha - How nice (special) that you now have another son! Wow! Congratulations to all of you, and God bless you as you raise each for Jesus. 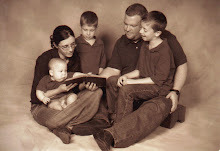 "Lo, children are an heritage of the Lord...Happy is the man that hath his quiver full of them..." Psalm 127:3 & 5. Troy you've done a great job! I told Martha how I've loved your posts! This family sure does have a thing for boys! now THAT'S a neighbor's husband!